Well, those wacky Trifectans have gotten even wackier! This week, instead of giving us the third definition of a word, they’ve given us a buffet! Buffet, sadly, does not fall within the alphabetical range of Bab to Bac. But what does? 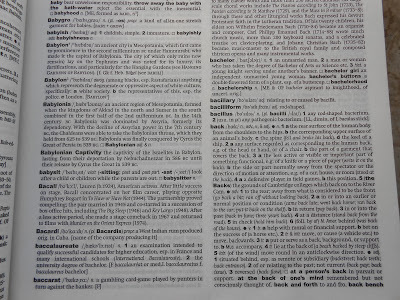 Why, the 99th page of the Oxford English dictionary! And to be even wackier, this time they want exactly 99 words! So even though I’m rarely mentioned for the challenge, I do want to assert myself as wackiest. The first poured himself a Bacardi. The second pulled out a steel shaft, toying with the bacilliform. “Who’s this?” he asked of the armored man under the ‘Merriam-Webster-Trifecta’ banner. The first man rolled his eyes. “Did you even read the dictionary? *Note on today’s post: There’s a much longer version of this which has all the words on the Oxford page, but it was way over 99 so I couldn’t use it. You’re welcome. This entry was posted in BIG FUN, Death, Trifextra Challenge and tagged Bacardi, Bachelor, bacilliform, Back, Nowhere Man, Oxford English Dictionary, The Beatles, Trifextra Challenge. Bookmark the permalink. Haha…I love the way your brain works!! Well, seeing as how there’s Bacardi involved, anything is doable, right? Always love the twists of warpness that you deliver. Thanks! Unfortunately, it always looks like a perfectly straight line to me. That’s what makes it good. You get my vote for whackiest even when you’re not doing the Trifecta. You’re welcome. It’s nice to know i’ve made exactly the impression I was going for. Unfortunately for me…and most likely you…I understood every single word, especially the “b” ones…and everything B-tween. Nonono…. Ha! I can admit to you that I had no idea what a bacciliform was until I saw the definiton. I did, however, have a great line using both babyish and babushka that I had to cut to make the 99 word linit. I feel that way on Twitter a lot. I could totally imagine the guy at the end saying that, haha :D. Great job though. Such a challenge! But you’ve made it through. I guess you deserve pie now! Everyone else can have the trophies. You are a clever lad! Nicely done. That sound much better than Profuse balderdash! H! Love your idea of a party! 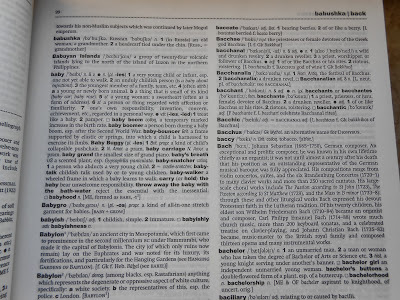 I’m actually proud that I own a dictionary. Even if I never use it either. I salute your baccalaureate knowledge Guap! I was even on the Dean’s…list. This is mental in the best way possible. Loved it – had me laughing out loud from its title-less title! Thanks for linking up and tell everyone to join us for our 99th! Sincerely, getting a laugh out of you is worth more to me than winning. And thanks for building the community with your challenges. yep, BEST one yet, complete with silliness and giggle. So frustrating when people just don’t know how to use a dictionary! Also, I love the subtitle. I think by the end, the first guy wanted to use it as a weapon. Hilarious! The bachelor ending was brilliant. You’ve got me hooked on the Trifecta. I’d say you also have me hooked on the Bacardi but that happened long before I happened upon your blog. Trifecta puts up a weekday challenge, and something usually more lighthearted for the weekend. I don’t usually do prompts, but this one I love, and it;s a great community. Truly, I thank you diaphonously for the honor! Oh I just love the words you come up with at Guapo Labs! I don’t think anyone should give you grief for that title. It’s perfect! Nah, I prefer to leave all my grief causing reasons in the story! Ha! It seems like you used all of the words to fill up a Mad Libs page. 🙂 How very clever. I’ve been stumbling around in your blog, El Guapo. I scrolled down too far and was mesmerized by a naked Burt Reynolds, so I clicked him to see where I would go. 🙂 I remember when my sister and I bought that Cosmopolitan magazine new from the store for my mom. Ahh … good times. But I’m back up here now, I’ve listened to Nowhere Man, and I’m impressed you own a hard copy of a dictionary. Very creative 99 words there, sir. Whatever you do, don’t search here for “lederhosen”. Seriously, that picture can’t be unseen. ok, you’re definitely the whackiest! Except for that armoured guy. Ambitious! I’m impressed. Alas, I used “back”. Ha! In your talented hands, opuses (opii?) have been crafted with less. It’s my job to be silly, um, kind. Yes, but that kind??? Are you sure you’re over your cold? Definitely not over the cold, and definitely still very dosed up on that wonderful sudafed stuff. Tastes like flying. Just try not to taste the landing. Ew. Okay, I’ll close my mouth before I come down. Lost in all this wackiness is the fact that, man, you are one brilliant writer. Wow, for once I’m the one being serious about something. I feel so, like . . grown up. Honestly, I’m glad someone around here can be serious every so often. This is actually the first appearance of the Beatles as Today’s Music. Alas, I couldn’t work in Bocehpus. Very original… and I love a self referential piece..
That seems to be my general niche for Trifecta. You get my vote….well once your check clears…..
Must have been lost in the shutdown…. I hear they’re planning a sequel in february. I’m already planning for February…..building a bomb shelter while I have some money. I’m really looking forward to you trying Q – especially if you try NOT to use anything with QU. That should be really interesting! I find that challenge more cool than wacky. And you performed admirably sir, although that should come as a surprise to no one. Nowhere Man is a great song. My initial thought on seeing that was that the first time I heard it, was the Bee Gees version on their lamentable Sgt Pepper album of the late 1970s. HOWEVER, I just did a quick wikipedia check, and that song is not on the album. Still, I’m SURE it was some kind of bastardized version that I heard. The Bee Gees (before they went falsetto and disco) were a great rock band, way back when.